Why is Yammer Called Yammer? It almost goes without saying that there’s no shortage in the number of ways we communicate with one another. In our personal lives, we text, Snap, WhatsApp, and Pin one another. But it doesn’t stop there. We also have an entirely separate set of options for how we communicate with our coworkers and colleagues. There’s email, Slack, Basecamp, Zoom, Skype, and Yammer. Plus a slew of other options. In most cases, messaging platforms and project management tools are meant to make open communication easier. They increase transparency within the workplace and are often designed to get everyone involved and keep them there. The features vary by platform, of course, but the idea is the same: to make teams more productive. More often than not, working together requires constant communication. It requires a lot of back and forth, a lot of discussion, and a lot of input or feedback from other people. It’s not always feasible for this kind of discussion to take place in person. It can also be frustrating via email, but the chatter is essential. Yammer, perhaps more than other tools, acknowledges that. So much so that the concept is even conveyed in the name. After leaving PayPal in 2002, Yammer founder David Sacks was working on a genealogy website, known as Geni, when he developed an internal communications system to help employees share information and facilitate the project. The tool became so useful that he and his co-founders, George Ishii and Adam Pisoni, decided it deserved its own company. Why is it called Yammer? So they launched Yammer in 2008. According to the CPO, Jim Patterson, they wanted the name to reiterate this concept of persistent communication. And yammer, by some definitions, explicitly means to talk and talk… and talk for a long time. It wasn’t the only name considered, though. Before launch, Patterson recalled considering other names, like Workfeed, Chatter, and Huddle (some of which made it to product names within the tool). In the end, the alternatives didn’t make the cut because the team saw them as “too forgettable.” On Quora, Patterson wrote, “Yammer was selected because it was the only [name] that everyone still remembered several months later and the domain name was available for purchase.” As luck would have it, the name passes a few other rumored tests, too. It includes double letters and one worth high points in Scrabble. Within two years, the software claimed as many as one million users across 80,000 companies around the globe. 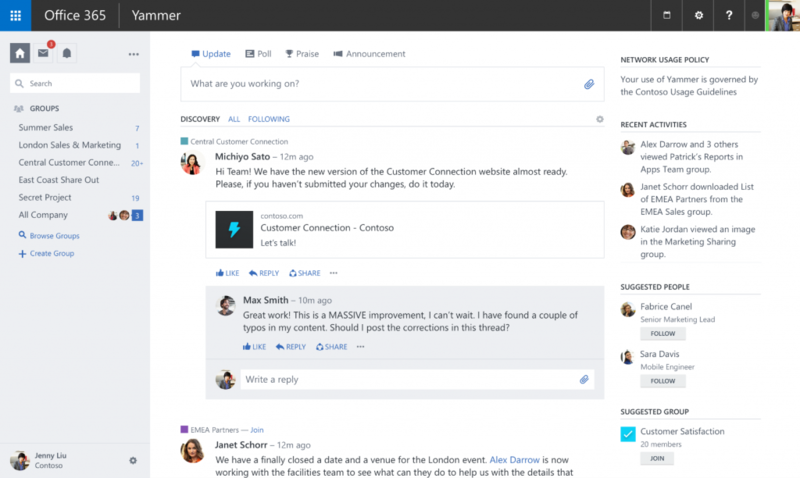 As good a time as any, Yammer rolled out version 2.0, dubbed “Facebook for the Enterprise.” It’s no coincidence that some of the features speak specifically to the needs of larger organizations. For example, the company limits access to the network by determining each user’s internet domain. This way, only approved addresses can join and privacy is protected. Another feature enables third-party developers to build and sell their applications direct to platform users. With capabilities like this and others encouraging real-time engagement regardless of department, geography, or applications, Yammer caught the eye of several Fortune 500 companies. Today the platform still proudly touts collaboration at its core. “Bring your team together on Yammer. Make better decisions, faster,” the about page beckons visitors. And by operating a freemium model, the invitation is tempting. The social-network-for-your-office entices people by allowing them a free version for as long as they like. Then, they offer premium or paid versions via an Office 365 plan. The affordability may be another one of its biggest draws, allowing users to keep the conversations going for less, or at least giving the rest of us something to yammer about. Thanks for reading Why is Yammer called Yammer! How do you think Yammer stacks up against other PM tools? #whyisitcalledYammer.